Monday & Weds mornings 10:00 - 11:00 for beginners; 10:30 - 11:30 for Intermediate. FEB - JUNE: - Tai Chi & Qi Gong Wellness continues at Mollie Nye. Master Gee's Black Belt Academy, 5508 Hastings Street, Burnaby. JULY: - Tai Chi & Qi Gong Wellness continues at Mollie Nye. * Sessions times are guidelines, I also do the odd Saturday morning, late afternoon or evening appointment. Once a month all day Thursday is available. This is a combined class of Tai Chi and Qi Gong Wellness for adults. The class begins at 10:00am with a half hour of instruction for beginner Tai Chi; at 10:30 the Intermediate Tai Chi Players arrive and together we all do a half hour of Qi Gong, then at 11:00 the beginners leave and we do half an hour of Intermediate Tai Chi. The Qi Gong is all guided and suitable for anyone. We explore different styles of Qi Gong and Chinese Health practices to bring balance and well-being into the body, mind and spirit. Students often comment on how much better they feel after classes. This Tai Chi class is offered through the Lynn Valley Services Society and so the cost is very reasonable! Students can join the beginner class at any time; payment can be made by cash or cheque prior to the class at the venue or through the North Shore Recreation Commission (by telephone or online). Drop-In is also available, come and try this class - your body will thank you! Qi Gong movements that will guide the qi to its optimal pathways in the body and will allow us to experience ourselves in a new expanded state of being. Please bring a yoga mat and blanket for the Gong Bath portion. The Qi Gong portion of the class will be guided and is suitable for people who are both new to or experienced in Qi Gong movement. Sign up early to ensure that you get a space, this event SOLD OUT last time. Cost $40.00, payable by Paypal (below), email transfer (Blanche@BlancheBoyce.com), cash or cheque. To be on a Mailing List for this class or others please fill out the Contact Form below. Description: This is a 'Follow Along' class that is suitable for beginners and seasoned practitioners alike. A number of different Qi Gong styles will be introduced; the emphasis will be to have fun, to learn a little about Qi Gong and to work with nature and the elements that surrounds us. Please Note: There is no class on Weds July 11th. There is no class if it is raining. for class updates (such as rain cancellations) please let Blanche know. Email Blanche@BlancheBoyce.com with any questions. Sorry, we are sold out for this event! This workshop is for the benefit of the ﻿North Shore Women's Centre (NSWC). Saturday Afternoon: 1:00 - 4:15pm. Join us for this Manifesting Workshop using Qi Gong Movement, Meditation and Mindfulness to bring our goals and aspirations into focus and fruition. We'll be setting our intentions and creating our own Vision Board (a visual representation of our intentions) to propel transformation in our lives. Vision Boards can be used for both tangible and intangible dreams; they are powerful tools appraised by many inspirational leaders and teachers. We'll learn the rules on how to create them and how to use them more effectively in our lives. Basic materials supplied, further information provided upon registration. Description: This is a 'Follow Along' class that will be suitable for beginners and seasoned practitioners alike. ​The focus of this class will be to learn some basic Tai Chi Movements as well as to begin learning a Yang Style Tai Chi Form. The class is suitable for beginners, people who haven't done Tai Chi for awhile and for anyone looking for more practice time and instruction. The class will also include some Qi Gong movement at the beginning of each class. If you aren't sure if this class is for you please email or call for more information. ​To be on the Mailing List for notification of this class and others please fill out the Contact Form below. The focus of this class will be to learn some basic Tai Chi Movements as well as to begin learning a Yang Style Tai Chi Form. The class is suitable for beginners, people who haven't done Tai Chi for awhile and for anyone looking for more practice time and instruction. If you aren't sure if this class is for you please email or call for more information. Blanche is also teaching a Tai Chi / Qi Gong Class in North Vancouver at Mollie Nye House (Mon & Weds mornings) through the Lynn Valley Services Society. (Beginner & Intermediate) If this is of interest to you please see below or email for more details. The focus of this class will be to learn some Tai Chi Movements as well as to learn the Yang Style Simplified Tai Chi 24 Form. The class is suitable for beginners, people who haven't done Tai Chi for awhile and for anyone looking for more practice time and instruction. 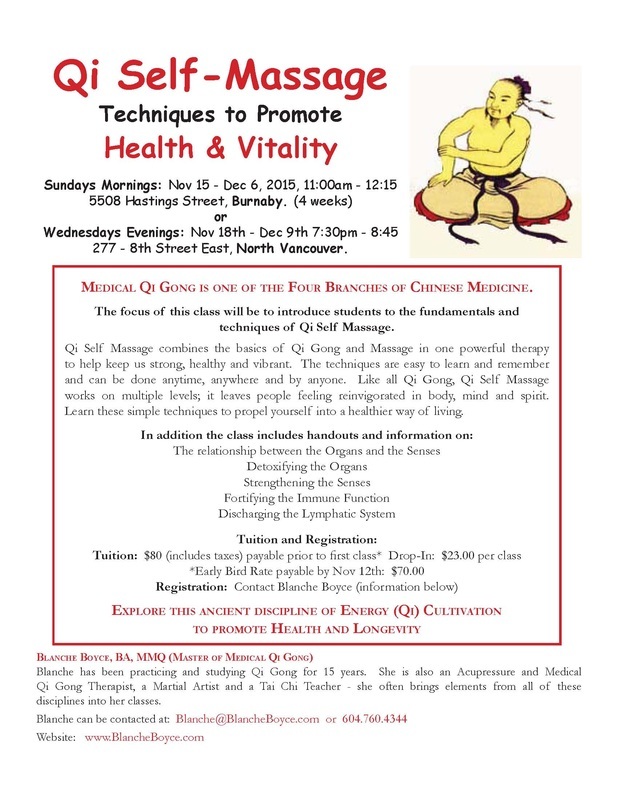 Blanche is also teaching a Tai Chi / Qi Gong Class in North Vancouver at Mollie Nye House (Mon & Weds mornings) through the Lynn Valley Services Society. (Beginner & Intermediate) If this is of interest to you please email for more details. Tuition: By Donation to the ﻿North Shore Women's Centre (NSWC). This workshop is for the benefit the NSWC. Burnaby Students are welcome to make up classes in North Vancouver, and vice-versa. The Chinese discovered thousands of years ago that certain sounds exert a beneficial effect on our bodies and a calming effect on our minds. They also practiced forms of Qi Gong Movement associated with the Dragon - a mystical animal revered for its auspicious power, vital energy and longevity. In this series of classes we will be learning Healing Sounds and Dragon Qi Gong Movements to optimize our own health and longevity. Join us, to learn these simple techniques to establish a healthier way of living. Join me for an exciting afternoon of Qi Gong and Gong Sound Bath with Gongmaster Paul Bissonette - details on the flyer below. Bring a yoga mat and blanket for the relaxation Gong Bath portion when Paul will play his amazing assortment of Gongs and Tibetan Bowls. The Qi Gong portion of the class is suitable for people both new to or experienced in Qi Gong movement - it will all be guided. Sign up early to take advantage of the Early Bird Rate. To be on the Mailing List for notification of these class and others please fill out the Contact Form below.